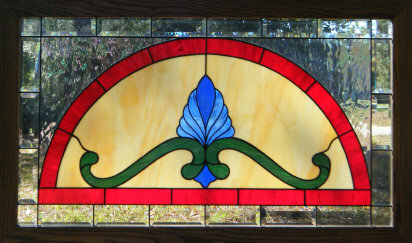 The following stained glass windows are available for immediate sale. Please click image for larger view, finished dimensions and price. All the transoms and windows on this page are framed with hand made solid oak frames and are designed to hang inside an existing window. Any variation of these designs, or the designs on any other page, can be custom built in any size or color. 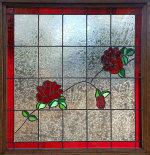 Please contact me to discuss your stained glass idea !